I just wanted to say a huge thank you for the Valentine’s afternoon tea you delivered for my sister and brother-in-law. They were absolutely delighted. It was the perfect gift for a couple with a young baby who needed a bit of special time together. I really appreciated how easy you made everything. They particularly raved about the brownies! Thank you so much for bringing so much joy to a couple who really deserved it. We absolutely loved it. Everything has been devoured. So glad we found you! The staff on the HQS Wellington said that your cake was definitely the nicest they had ever tasted!!! Thank you so much for the beautiful birthday cake – it was enormously admired. It was delicious and suitable for everyone – I don’t think anyone realised it was gluten free! Thank you very much for my 70th birthday cake. It was delicious and it looked fantastic! 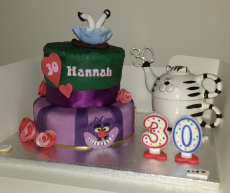 Thank you for your wonderful contribution to Hannah’s 30th birthday. The cake was amazing and enjoyed by all who ate a piece. Your attention to detail is incredible and, most of all, Hannah was thrilled with it. A delicious, moist cake which was enjoyed by all. I’d recommend it to anyone. Thanks Jayne for a brilliant afternoon tea. Everything was fresh and delicious. Jayne also made a fabulous Gluten Free cake for us which everyone enjoyed. Mum-to-be was thrilled at the surprise. Jayne was extremely accommodating with out dietary requirements (coeliac, lactose intolerance and vegetarian) and the delivery and collection were efficient and friendly. cant recommend highly enough!! Just Adding to My Parents Review Above, by saying a Big THANK YOU! For My Wonderful Marvelous! 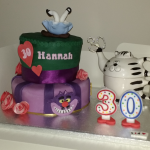 Alice in Wonderland Cake! It was very tasty and just how I had Imagined it! I took Photographs of everything so have made some Photo Collages of it all, I will try and Attach it to your Site. Thanks Again for your time and effort and patience and creativity that went into help making it! Who knows what you will be able to Create Next?! 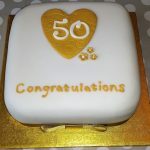 Thank you so much for cake you made at quite short notice for my son and his fiance, for there engagement party ,they loved it ,, tasted amazing too as well as looking fantastic , Japanese theme !